Home How to start in Online Sports Betting? How to start in Online Sports Betting? Sports betting is one of the most popular types of gambling around the globe, and thanks to the internet, you no longer need to visit a physical bookmaker in order to make a sports bet. If you are looking for a guide to get started in sports betting or just looking for some tips to make easy money in this market, you’ve reached the right place. The world of betting has shifted to the internet, and it is the time that you do as well. 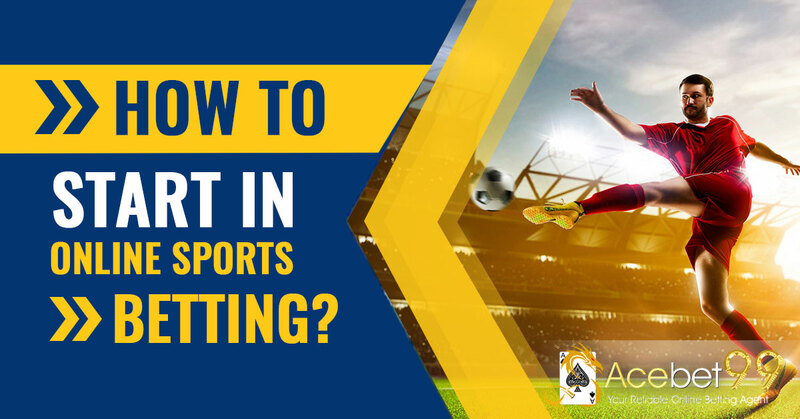 Some of the benefits of online betting are that you can place bets on-the-go, make deposits using debit/credit cards, place bets online, enjoy lucrative welcome bonuses, etc. In this article, you will learn the process and tips for placing sports bets online and making most out of free welcome bonuses. Before you can start making bets online, you will have to find and join some of the best-reputed sports betting websites on the internet. Check if the website if offering some kind of joining bonus that you can leverage from. Many of these sites may also offer you attractive bonuses on your first and/or subsequent deposits. It may be beneficial to join a sports betting website around a major sporting event as you may get better joining offers from several such websites. Be sure to have your favorite sports/games in mind before you decide to join a website. You can do some research beforehand in order to find the best sports for betting and upcoming major events in that particular game, and accordingly, find the best website for placing your bets. Also, try finding a website that allows live betting, or in-play sports betting, where the odds change during the game. Once you’ve joined a website, you can start making bets. Go to your selected game, choose from the available odds, place the bet (stakes) amount and hit it. The results will be displayed as the game proceeds. There are different types of betting odds in a sporting event for different markets. You can choose any of the odds, depending on the availability. The simplest of all is the decimal odds, where the odds are in decimal numbers. You choose your odd and then make a stake, your winning will be calculated by multiplying your stake to the odds you chose. US odds, or American odds, or US money line are a little complicated. There are favourite and underdog teams. The negative odds are placed on the favourite team while the positive number represents the odds for the second team. The risk and winning payouts are higher for underdog bets. Indonesian odds have a fixed odd decided at the beginning of the game. The number means that the bettor will have to deposit that amount in order to win 1 unit (whatever it is worth). Malay odds are similar to US odds, except for the base unit amount. Instead of $100, the base unit here is 1.00 and the odds are decided accordingly. Negative Malay odds are less probable to win but have higher payouts. Fractional odds are similar to decimal odds, only the odds are in a fraction instead of a decimal number, however, with the same value. Hong Kong odds are more or less similar to the decimal odds, only the final winning doesn’t include the original stake. A good online sports betting site will offer you a number of bet options through different markets. Most sporting events support betting on outcomes, as well as on points, number of goals, cards and many other things. Here are some of the most common types of sports bets. The 1X2 bets are used in almost all team sports, especially in soccer, where the bets are placed on the half-time and full-time for a Draw, Home team wins, or Away team win. HT-FT or half-time/full-time, bets are similar to 1X2 bets where you can predict match outcome at each stage. In some case, you can also bet on the odd/even score of the team at half-time or full-time. Parlay bets involve grouping of multiple bets to increase the winning odds. The bets are placed on the set of poor individual odds. Handicap (HDP) betting involves placing winning wagers on a team that has been a head start in the game, in terms of goals or points. The Over/Under (OU) are special kind of bets in which wagers are placed on a fixed line (number) that indicates whether the total goals/cards will be over or under that line. Correct score, as the name indicates, involves making bets on the exact score at half-time or full-time in a game. Outright or advanced bets are also becoming increasingly popular in sports betting. This involves placing weekly or monthly advanced bets on the winning of upcoming events such as the World Cup or Asia Cup. A spread bet is placed on a range of outcomes rather than on a fixed number. The odds placed on a particular event or game may also change depending on the number of bets placed on it. For example, a favourite soccer team might have low winning odds just because the number of bets is high on it. In the beginning, you will even find that different odds are placed by different online betting sites on the exact same game. This is why it is important to search around before choosing a website for betting. Alternatively, you can choose to have accounting on multiple sites to enjoy bonus and other benefits from all of them. What are the best online betting bonuses? Most of the online sports betting sites will offer you some kind of joining bonuses, as well as deposit bonus, money back, free bets and other offers. Here is how you can find the best ones and make the best out of these offers. Most betting websites will give you some bonus credit when you join the website or when you make your first deposit. In both cases, you get free credit to make the best of your favourite games. However, some websites will match your deposit only after you win your first bet. Money backs are offered by betting sites in certain cases when you have lost several bets in a row. Be sure to know the terms before you start playing. Some sports betting websites will offer you free bets instead of casino credits to let you place some free bets after you make an initial deposit and qualify your first bet. In some sports events, such as horse racing, a gambling website may offer you higher odds than the market in order to make you join their site. A cashout deal allows you to leave in the middle of the game and take a smaller payout, rather than actually finishing your bet.